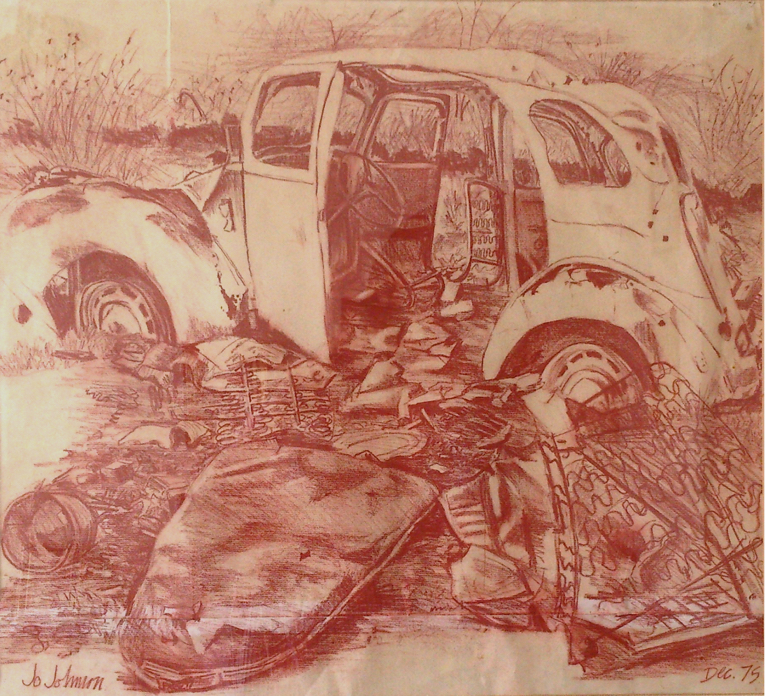 Ford Prefect, Conte Chalk on Ingres Paper, 25" X 25"
I made this drawing of what was left an old Ford Prefect, which had been abandoned on a disused railway line outside the village where I used to live many moons ago! I was a “wet behind the ears” first year student at Glasgow School of Art at the time and I made the drawing in response to the annual First Year Drawing competition which was run over the Christmas and new Year holiday period that year. The title that we were asked to illustrate was “Inside/Outside” – an intriguingly open ended subject title which gave lots of scope for choice. I went out for a walk one day, came upon this old hulk rotting away quietly and thought, “Wow! that would make a great drawing!” I remember it well because it was the middle of winter and it took me three very cold mornings to finish the drawing! I pulled the battered bonnet of the car and the seat springs out and re-arranged them to make it more obvious that the inside was actually outside!